NK T cells recognize glycolipid Ags such as α-galactosylceramide (α-GalCer) presented by the MHC class I-like molecule CD1d. In this paper we have studied the in vivo effects of α-GalCer on the generation of adaptive immune responses. Treatment of mice with α-GalCer resulted in rapid activation of NK T cells and production of the cytokines IL-4 and IFN-γ. However, after this initial stimulation, NK T cells became polarized for the production of IL-4. Further, as soon as 6 days after α-GalCer injection, a marked increase in serum IgE levels was observed. Administration of α-GalCer at the time of priming of mice with protein Ag resulted in the generation of Ag-specific Th2 cells and a profound increase in the production of IgE. Collectively, these findings indicate that α-GalCer may be useful for modulating immune responses toward a Th2 phenotype during prophylaxis and therapy. Natural killer T cells represent an unusual group of T lymphocytes that share receptor structures with conventional T cells and NK cells (1, 2). NK T cells express intermediate levels of a semiinvariant TCR (Vα14-Jα281 paired with Vβ8.2, 7, or 2 in mouse), together with NK cell receptors (NKR-P1 and Ly-49 in mouse). These cells are found in the thymus, spleen, liver, and bone marrow, but are rare in lymph nodes and the gut. Unlike conventional T cells that recognize peptide Ags presented by the classical MHC class I or class II molecules, NK T cells are specific for glycolipid Ags bound with the MHC class I-like molecule CD1d (1, 2, 3, 4, 5, 6). Expression of CD1d is required for the development of NK T cells (7, 8, 9, 10). When stimulated through their TCR, NK T cells quickly produce a variety of cytokines, including large amounts of IL-4 and significant amounts of IFN-γ (1, 2). It was therefore postulated that NK T cells may influence the differentiation of naive CD4+ T lymphocytes into functional Th cells (11). However, deletion of β2-microglobulin or CD1d molecules in mice did not affect the differentiation of conventional CD4+ T cells into Th cells with distinct functions (8, 9, 10, 12, 13, 14), indicating that NK T cells are not absolutely required for the generation of polarized Th responses. The glycolipid α-galactosylceramide (α-GalCer)3 was originally isolated as a natural product from marine sponges (15, 16). Several studies demonstrated that NK T cells specifically recognize this natural product and its synthetic homologue (KRN7000) and that this recognition requires expression of CD1d (2, 4). Further studies indicated that reactivity to α-GalCer is highly specific for NK T cells that express the invariant Vα14-Jα281 TCR in mice (17). In vitro stimulation of mouse spleen cells by synthetic α-GalCer results in proliferation of NK T cells and production of both IFN-γ and IL-4 (2, 4, 17). In this report we have studied the in vivo effects of α-GalCer on the production of cytokines and the generation of an adaptive immune response. Our results demonstrate that α-GalCer directs the differentiation of naive T cell precursors toward the development of a Th2 phenotype. These findings indicate that NK T cells can influence the Th1/Th2 balance and that in vivo treatment with α-GalCer may be useful for manipulating this balance during prophylaxis and therapy. C57BL/6 mice were purchased from The Jackson Laboratory (Bar Harbor, ME). CD1d-deficient (9) mice and controls on a mixed C57BL/6 × 129 background or from the sixth backcross to C57BL/6 were bred in the animal facility at Vanderbilt University School of Medicine (Nashville, TN). α-GalCer (KRN7000) was chemically synthesized (18) and chicken OVA was purchased from Sigma (St. Louis, MO). The following Abs were used for flow cytometry: anti-NK1.1-PE, anti-TCRβ-cychrome, anti-CD69-FITC, anti-CD80-FITC, anti-CD86-FITC, and anti-B220-FITC (all from PharMingen, San Diego, CA). Stainings were performed by incubating cells with the Ab on ice in PBS plus 2% FCS, 0.1% azide, and anti-FcγRIII Abs (clone 2.4.G2 from the American Type Culture Collection (ATCC), Manassas, VA) for 45 min. Cells were then washed and analyzed using a FACSCalibur flow cytometer (Becton Dickinson, San Jose, CA). Splenocytes (4 × 105) were incubated with titrated amounts of α-GalCer in RPMI 1640 medium supplemented with 10% FCS, 50 μM 2-ME, 2 mM glutamine, antibiotics, and 10 mM HEPES (complete medium) for 72 h. For proliferation assays, 0.5 μCi of [3H]thymidine (NEN, Boston, MA) was then added to the wells, and after an additional 16 h of culture, cells were harvested with a cell harvester (Tomtec, Orange, CT), and uptake of radioactivity was measured with a betaplate reader (Wallac, Gaithersburg, MD). For measurement of cytokine levels, culture supernatants were collected and measured for IFN-γ and IL-4 contents by ELISA. α-GalCer (4 μg/mouse in 400 μl of vehicle) or vehicle (0.025% polysorbate-20 in PBS) were injected i.p. (2 μg) and i.v. (2 μg) into mice. Similar results were obtained when DMSO was used as the vehicle in which to dissolve α-GalCer. For immunization with OVA, mice were injected s.c. with OVA (100 μg/mouse) and α-GalCer (4 μg/mouse) or with OVA and vehicle emulsified in CFA (Becton Dickinson). Lymph node cells from immunized mice were depleted of CD8+, MHC class II+, and NK1.1+ cells by panning with anti-CD8 (clone 2.43; obtained from Dr. B. Graham, Vanderbilt University School of Medicine), anti-MHC class II (clone Y-3P from the ATCC), and anti-NK1.1 (clone PK136 from the ATCC) Abs, respectively, on plates coated with goat-anti mouse IgG (H+L) (Jackson ImmunoResearch Laboratories, West Grove, PA). These purified CD4+ T cells (3 × 105/well) were then cultured with 4 × 105 irradiated syngeneic spleen cells in the presence of graded doses of OVA Ag. After 60 h of culture, supernatants were collected for measurement of IFN-γ and IL-4 by ELISA. After 72 h of culture, cells were pulsed with 0.5 μCi of [3H]thymidine, cultured for another 12 h, and uptake of radioactivity was measured as above. Spleens were harvested from mice and total RNA was isolated (SV Total RNA Isolation System, Promega, Madison, WI). Cytokine levels were analyzed by RNase protection (RiboQuant multiprobe kit, mCK-1 probe set, PharMingen) using 5 μg of total RNA for each reaction. Protected fragments were visualized by autoradiography. A standard sandwich ELISA was used to measure mouse IFN-γ, IL-4, and Ab isotype levels. IFN-γ, IL-4, and total IgE were measured using purified and biotinylated Ab pairs and standards from PharMingen. For detection, streptavidin-HRP (HRP) conjugate (Zymed Laboratories, South San Francisco, CA) was used in conjunction with the substrate 3,3′,5,′5′-tetramethylbenzidine (Dako, Carpinteria, CA). Ag-specific IgE levels were measured similarly, but plates were coated with 10 μg/ml of OVA instead of capture anti-IgE Ab. For measurement of Ag-specific IgM, IgG1 and IgG2a Abs immunoplates (Maxisorp, Nunc, Rochester, NY) were coated with 10 μg/ml of OVA in 0.1 M Na2HPO4. After blocking with 1% BSA in PBS, serial dilutions of antiserum were added. Detection was performed with anti-IgM-HRP, anti-IgG1-HRP, and anti-IgG2a-HRP Abs (all from Southern Biotechnology Associates, Birmingham, AL), in conjunction with the substrate o-phenylene-diamine (Sigma). Concentrations were calculated on the basis of standard curves of Ab isotypes (all from Southern Biotechnology Associates) run in parallel ELISA assays. Previous in vitro studies have demonstrated that α-GalCer stimulates NK T cells to produce both IFN-γ and IL-4 (2, 4, 17). We wanted to test whether α-GalCer has similar effects on NK T cells when administered to mice in vivo. Wild-type and CD1d-deficient mice on a C57BL/6 or mixed C57BL/6 × 129 background were therefore injected with 4 μg of α-GalCer; 18 h later mice were sacrificed and splenocytes were cultured in vitro for 72 h to measure proliferation, or alternatively, cultured for 60 h, after which IFN-γ and IL-4 levels in these cultures were measured. Fig. 1⇓A shows that α-GalCer but not vehicle induced strong proliferation of splenocytes and the production of significant amounts of both IFN-γ and IL-4. These effects of α-GalCer were absent in CD1d-deficient mice that lack NK T cells (Fig. 1⇓A). Administration of α-GalCer to mice also resulted in significant amounts of IFN-γ in the serum of wild-type but not CD1d-deficient animals (Fig. 1⇓B). Although serum IL-4 levels at this time point (18 h) were below the detection limit of the ELISA assay used (data not shown), significant IL-4 levels could be detected in the serum 2 h after α-GalCer injection (data not shown). RNase protection experiments further demonstrated that α-GalCer induced a variety of cytokines in the spleen of wild-type animals, including the typical Th1 cytokine IFN-γ and the typical Th2 cytokines IL-4, IL-5, IL-6, IL-10, and IL-13 (Fig. 1⇓D). Cytokine production by NK T cells in response to α-GalCer was accompanied by an increase in the expression of the early activation marker CD69 by these cells (Fig. 1⇓C). Treatment of mice with α-GalCer results in production of Th1 and Th2 cytokines and polarizes NK T cells for the production of IL-4. 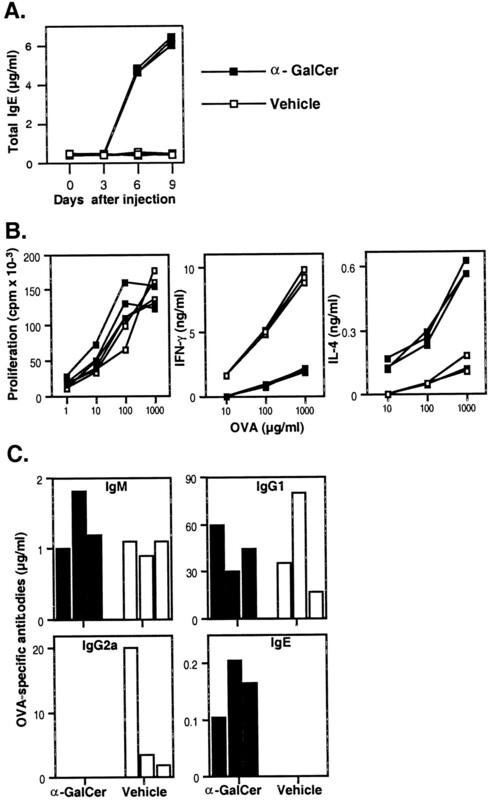 A--D, Cytokine production upon in vivo treatment of mice with α-GalCer. Mice were injected with 4 μg of α-GalCer (in vehicle) or with vehicle only. Eighteen hours after treatment mice were sacrificed. Spleen cells from these animals were cultured in complete tissue culture medium for 72 h (without adding additional α-GalCer), and proliferation of responder cells was measured by [3H]thymidine incorporation, or alternatively, spleen cells were cultured for 60 h, after which IFN-γ and IL-4 levels were determined in the culture supernatant by ELISA (A). Similarly, IFN-γ levels in the serum were measured (B) and mRNA expression of the indicated cytokines in the spleen was measured by RNase protection assays (D). Autoradiographs for the cytokine bands were exposed for 2 days, whereas the signals for the mRNA controls (P32 and GDH) were exposed for 2 h. Expression of CD69 by NK T cells was measured by staining with anti-NK1.1-PE, anti-TCR-cychrome, and anti-CD69-FITC, followed by flow cytometry (C). Results shown represent expression levels of CD69 on NK1.1+TCR+ cells only. 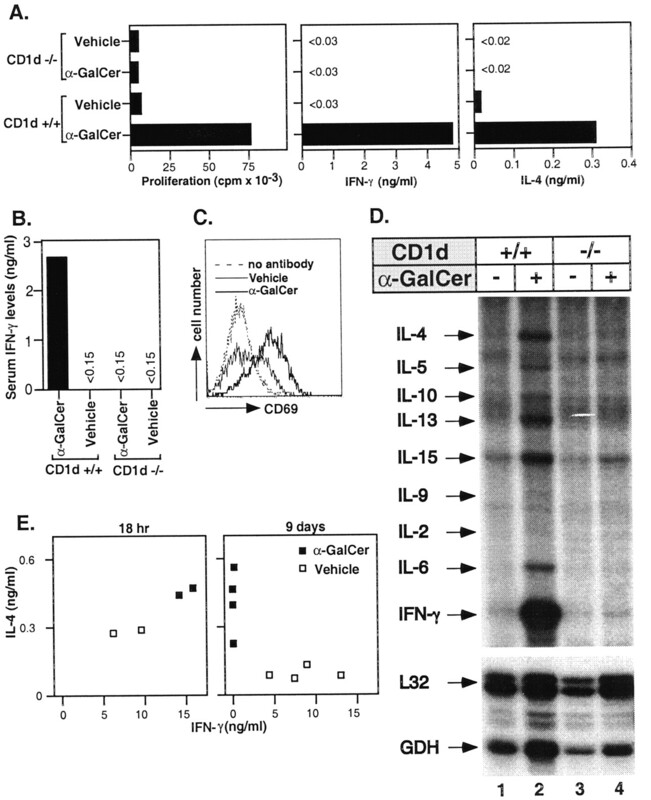 (E) Administration of α-GalCer to mice inhibits IFN-γ- but not IL-4-producing NK T cells. CD1d+/+ or CD1d−/− mice were injected with α-GalCer or vehicle; 18 h or 9 days later, splenocytes from these mice were stimulated in vitro with 10 ng/ml of α-GalCer. IFN-γ and IL-4 levels in the cultures were measured by ELISA. Results are shown for individual animals from one representative experiment of three separate experiments with two vehicle- and two α-GalCer-injected animals for the 18-h time point, and four vehicle- and four α-GalCer-injected animals for the 9-day time point. Conventional T cells can differentiate into IFN-γ-producing Th1 cells or IL-4-producing Th2 cells (19, 20). To test if NK T cells can be polarized to produce Th1 or Th2, cytokine patterns mice were immunized with α-GalCer and in vitro recall responses to this Ag were measured 18 h or 9 days later. Fig. 1⇑E shows that 9 days after a single injection of α-GalCer NK T cells became polarized for the production of IL-4. These effects were specific to α-GalCer-injected mice (Fig. 1⇑E), and dependent on CD1d, because CD1d-deficient mice never showed an in vitro response to α-GalCer, even when primed with this chemical before the assay (data not shown). These findings therefore indicated that immunization of mice with α-GalCer results in the generation of NK T cells that produce Th2 cytokines. We sought out to test whether stimulation of NK T cells with α-GalCer can influence adaptive immune responses. First, we measured the activation status of conventional T cells, B cells and NK cells. Fig. 2⇓A shows that as early as 18 h after administration of α-GalCer, the expression of the early activation marker CD69 was induced on mainstream T cells, B cells, and NK cells. This effect was not seen in CD1d knockout mice, indicating that these effects of α-GalCer are dependent on the activation of NK T cells. α-GalCer also induced expression of the costimulatory molecule CD86 on B cells, but did not induce expression of CD80 on these cells (Fig. 2⇓B). Injection of α-GalCer into mice induces expression of the activation marker CD69 on mainstream T cells, B cells, and NK cells, and expression of the costimulatory molecule CD86 on B cells. Wild-type or CD1d knockout mice were injected with 4 μg of α-GalCer or with vehicle only, and 18 h later spleen cell suspensions were prepared. A, Expression of CD69 on TCR+ (T cells), B220+ (B cells), and NK1.1+TCR− (NK cells) cells was measured by flow cytometry. B, Expression of CD80 and CD86 on B220+ cells was measured by flow cytometry. One representative experiment of four is shown. A key factor in the differentiation of naive CD4+ T lymphocytes into functional effector T cells appears to be the cytokines that are present in the environment in which these cells develop (19, 20). IL-12 is a potent inducer of Th1 immune responses, whereas IL-4 promotes the development of Th2 immune responses. Our finding that α-GalCer polarizes NK T cells for the production of IL-4 suggested to us that this agent may promote Th2 responses. This possibility was also suggested by our observation that α-GalCer induces expression of the costimulatory molecule CD86 on B cells, because previous studies have shown that Ag presentation in the context of CD86 promotes Th2 development, whereas CD80 provides a more neutral differentiative signal (21, 22). To test this hypothesis, we measured IgE levels in the serum of α-GalCer-treated animals. Fig. 3⇓A shows that as early as 6 days after administration of a single dose of α-GalCer, a dramatic increase in total serum IgE levels was observed. No significant differences were found in the serum levels of IgM, IgG1, and IgG2a (data not shown). Administration of α-GalCer to CD1d-deficient mice did not influence serum Ab isotype levels (data not shown). Treatment of mice with α-GalCer directs conventional T cells to the acquisition of a Th2 phenotype and production of IgE Abs. A, Effects of α-GalCer on serum IgE levels. Wild-type mice were injected with α-GalCer (4 μg/mouse) or vehicle. Mice were bled on days 0, 3, 6, and 9 after injection, and total serum IgE levels were measured by ELISA. Data are shown for individual mice from one representative experiment of four separate experiments with three vehicle- and three α-GalCer-injected animals. B and C, Administration of α-GalCer at the time of priming with protein Ag induces Ag-specific Th2 responses. Wild-type mice were injected with OVA (100 μg/mouse) together with α-GalCer (4 μg/mouse) or vehicle and emulsified in CFA. Eight days later mice were sacrificed and OVA-specific CD4+ T cell proliferation, cytokine production (B), and serum levels of OVA-specific Ab isotypes (C) were measured. Data are shown for individual mice from one representative experiment of four separate experiments with three vehicle- and three α-GalCer-injected animals. To measure effects of α-GalCer on adaptive immune responses more directly, mice were immunized with the protein Ag OVA together with α-GalCer in an emulsion of CFA. Eight days later, Ag-specific CD4+ T cell responses and Ag-specific serum Ab levels were measured. Fig. 3⇑B shows that OVA-specific T cells from α-GalCer-injected mice produced more IL-4 and less IFN-γ than OVA-specific T cells from vehicle-injected mice, indicating that α-GalCer biased the response toward a Th2 phenotype. This conclusion was confirmed by the levels of OVA-specific Ig isotypes in the serum, which indicated a strong increase in OVA-specific IgE and a dramatic decrease in OVA-specific IgG2a Abs in the serum of α-GalCer-treated animals (Fig. 3⇑C). 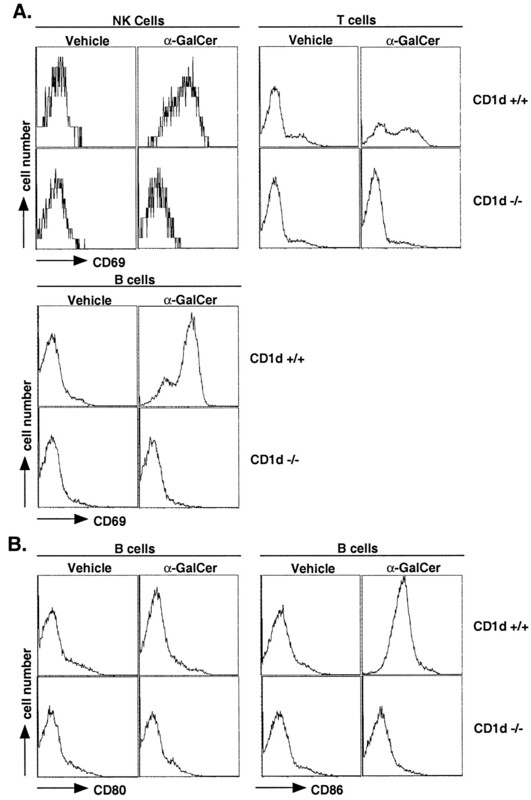 Similar experiments with CD1d-deficient mice showed that absence of CD1d, by itself, had no effect on OVA-specific T and B cell responses, and that the effects of α-GalCer on T and B cell responses in wild-type mice were CD1d-dependent (data not shown). Collectively, these findings indicate that α-GalCer can direct the differentiation of naive T cell precursors toward the development of a Th2 phenotype. The discovery that NK T cells can produce large amounts of IL-4 quickly after stimulation (1, 2) lead many investigators to suggest that these cells may be critically important for the development of Th2 immune responses (11). However, experiments with β2-microglobulin (12, 13, 14) and CD1d-deficient mice (8, 9, 10) subsequently showed that NK T cells are not absolutely required for the development of a Th2 response. In this report we demonstrated that treatment of mice with the glycolipid α-GalCer results in the activation of NK T cells and production by these cells of both IFN-γ and IL-4, but that after this initial activation NK T cells become polarized cells that produce only IL-4. These changes in NK T cells were paralleled by profound effects on the adaptive immune response: 1) induction of the activation marker CD69 on mainstream T cells, B cells, and NK cells; 2) induction of the costimulatory molecule CD86 on B cells; and 3) an increase in serum IgE levels. Coadministration of α-GalCer and protein Ag in adjuvant promoted differentiation of naive Ag-specific CD4+ T cells into Th2 cells, which resulted in a profound increase in Ag-specific IgE Abs. Collectively, these findings demonstrate that α-GalCer can direct adaptive immune responses toward the Th2 pathway. While our studies clearly demonstrated that α-GalCer polarized NK T cells for the production of IL-4, the mechanism by which this occurs remains unclear. One possibility would be that distinct populations of naive NK T cells produce Th1 and Th2 cytokines, and that α-GalCer selectively induces cell death in Th1 cytokine-producing NK T cells. An alternative possibility would be that naive NK T cells have the capacity to produce both Th1 and Th2 cytokines and that α-GalCer polarizes these cells for production of Th2 cytokines only. The latter scenario would closely resemble the differentiation program of conventional CD4+ T cells into Th2 cells. We are currently investigating the molecular and cellular mechanisms that are responsible for the polarized NK T cell responses induced by α-GalCer. Polarized immune responses play an important role in the outcome of a variety of diseases, including infectious, allergic, and autoimmune diseases (19, 20). For example, resistance to most intracellular microorganisms, including bacteria, protozoa, and fungi, is linked to the induction of Th1 responses, whereas resistance to most extracellular microorganisms such as parasitic helminths is linked to the induction of Th2 responses. Our findings indicate that α-GalCer, when used as a vaccine adjuvant with sensitizing doses of Ag, can shift subsequent immune responses to a Th2 pattern. Such a strategy should prove useful for inclusion in vaccines directed against microorganisms where Th2 responses provide protection from disease. Many inflammatory diseases, including organ-specific autoimmune diseases such as experimental allergic encephalomyelitis, insulin-dependent diabetes mellitus, and inflammatory bowel diseases, are characterized by pathogenic Th1 cells. Protection from these diseases can be achieved by switching the immune response from a Th1 pattern to a Th2 pattern, through immunomodulation with cytokines (19, 20). Immunomodulation with α-GalCer provides another, perhaps more attractive, way to inhibit the development of pathogenic Th1 cells in inflammatory immune responses. Indeed, we have recently demonstrated that repeated injection of α-GalCer into nonobese diabetic mice inhibits development of diabetes, and that this was associated with the production of Th2 cytokines by NK T cells (I. Serizawa, S. Hong, L. Wu, N. Singh, D. C. Scherer, T. Miura, T. Haba, A. C. Powers, Y. Koezuka, and L. Van Kaer, manuscript in preparation). Another striking property of α-GalCer is its ability to stimulate both murine and human NK T cells (23, 24, 25). The remarkable conservation of this recognition system was further underscored by the observation that both mouse and human CD1d molecules were able to present α-GalCer to NK T cells from either species (23). Thus, our in vivo studies with α-GalCer in mice are directly relevant to human disease conditions. Therefore, this chemical may be useful for modulation of immune responses during prophylaxis and for prevention or therapeutic intervention of a variety of inflammatory diseases. We thank Drs. Barney Graham and Dean Ballard for providing various reagents, Jie Wie for technical assistance, David C. McFarland for help with flow cytometric analyses, and Dr. Takashi Nishimura for sharing information before publication. ↵1 Current address: Department of Pathology, Stanford University School of Medicine, Stanford, CA 94305. ↵3 Abbreviation used in this paper: α-GalCer, α-galactosylceramide.